Dramatic footage of the Charlie Hebdo terrorists has emerged online, showing the gunmen calmly leaving the magazine's office in their car after murdering 12 people. The extremists are seen firing at a police car upon escaping the crime scene. 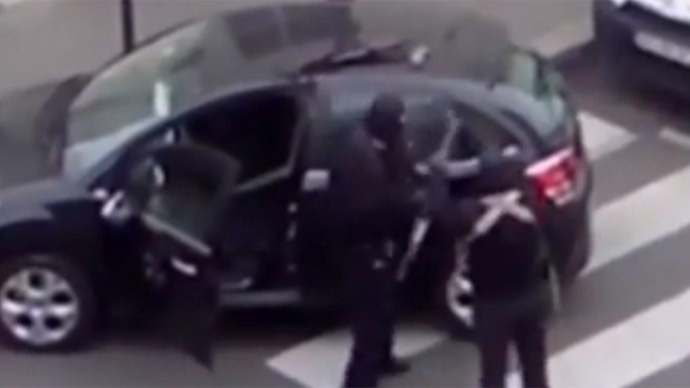 Filmed from a nearby window, the video shows two armed masked men, dressed in black – later identified as Said and Cherif Kouachi – approaching a black Citroen car. By the vehicle, the terrorists calmly check their ammunition and reload their guns, placing one of the automatic rifles on top of the car. "We have avenged the Prophet Mohammed," one of the armed men is heard shouting in French. "That's France for you," a man filming the scene is heard commenting behind the camera. After a brief discussion, the two attackers get into the car and start driving off. However, the man continues filming, apparently leaning out of his window, and shows a police car driving down the narrow street towards the black Citroen. The attackers then shoot directly at the vehicle, which has to travel backwards, while the terrorists drive off. The two people off screen couldn't believe their eyes, as they began discussing whether the bullets were real. Brothers Said and Cherif Kouachi killed 12 people – 10 Charlie Hebdo staff members and two policemen – on January 7. An earlier eyewitness video from the attack scene captured one of the officers shot at point-blank range, with a terrorist firing at the man as he lay already wounded on the ground. In a following manhunt, another terrorist – the Kouachis' accomplice Amedy Coulibaly – gunned down a police officer and then took hostages at a Paris kosher store, killing four. All three attackers were killed in police assaults. According to French police, more terror cell members may still be at large, with Prime Minister Manuel Valls having warned the nation to be on guard as "serious and very high risks remain."